As I was bopping around the house the other day I noticed I had quite a few little bunnies here and there besides the dust variety. I remembered KJ's challenge of seeing how many hearts we all had around the house, so here's my Easter/Spring challenge. Take pics of bunnies around your place, real or otherwise but ones that are always in plain view. Here are a few of mine! The top picture are some love buns in the kitchen over the glass cabinets. Here's a closer (yet blurry) view. These buns are on my baker's rack in the kitchen. The white one I bought at a yard sale in California for five bucks. It's some kind of Italian porcelain. I love her! 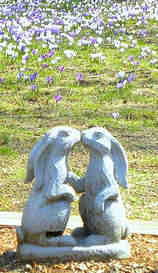 The two little stone bunnies were rescued here and there. I always keep these two little girls together. Here's my pretty Italian girl close-up. She's definately centerfold material! And the little girls in front of a tureen. They're quite shy! The little black one is really old and worn so she's hard to see clearly. I love blue and white pottery. I bought this ages ago. It holds many packets of seeds to be planted now that we're settled. Of course we have to make sure no more snow is on the way as well as no more flooding. Good grief! I adore this little guy! He's always up to something. Doesn't he look like he was caught in the carrot patch? He sits near my kitchen window and keeps me company as I do dishes. Remember my frozen buns this winter? Well now they're my soggy buns from all the rain we've had. (Thanks for all the calls and emails asking how we are!) The basement is flooded but not much was lost. And look...daffodils are coming up! I knew there'd be more surprises! Here are my love buns that I showed last week when Emma was running through the crocus. if they keep smooching I'll have more bunnies pretty soon! Speaking of Emma...where is she? hahaha!! I can see she's been editing photos again to make it into my post! Happy Animal Wednesday, bunny style! How many bunnies!They are all wonderful! I just don't have nearly as many Bunnies as you do... I love them, yes I do...but seem to have collected many more Bears, Swans, Geese and a few others (can't name them right now, but will one day). Wow, that's a lot of bunnies! So adorable too, Lolo! I myself have only One! I'll get a photo and upload to my blog! So happy to hear you are all right and not floating away somewhere. I have a few bunnies around too. Mom was the one who collected them and I kept a couple. Con made some cement ones for they yard too. How fun! I loved seeing these pics! hahaheehee emma! your Mother is so clever! is there an award for the most bunnies? who do you think might win? how come no counting bunnies in drawers or under beds? i was brought up to believe a bunny's a bunny. so far i have 3.
this is a very sweet thing you are doing just for me, right? i am very honored and i am going to save you some extra jellies from the wink-wink garden i am doing wink-wink by myself. 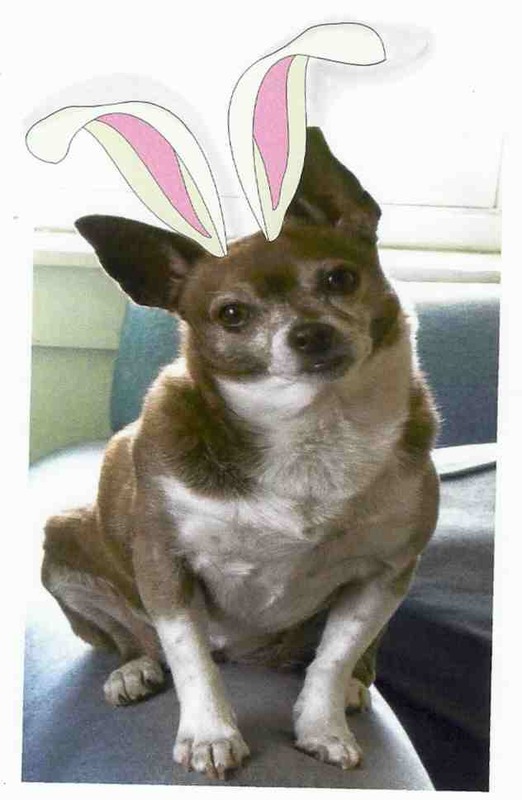 i can't believe you came up with the idea of people finding bunnies just to be nice to me. What a lot of wonderful bunnies. You do have quite a collection. So fun to see them all. How beautiful. Aw, they are all so cute and lovable. The bunnies I have ae the dust bunnies under the bed. Do I really have to post a pic of them? I don't think I have any bunnies either except for the dust variety. I do have lots of chickens and fat birds though. Your collection of bunnies are to die for, especially that Emma. I just love bunnies. They stay out during summer then get tucked away during winter to hibernate. I will look around and post soon. Lo, KJ's gift arrived yesterday and I was thrilled to find one of YOUR BEAUTIFUL, MAGICAL paintings. It is so perfect and I adore it! You and KJ are such amazing women -I am happy and honoured to call you both friends. Wow, that's a ton 'o bunnies! Love Emma's pic! I only have one bunny who doubles as a creamer - but he's awful cute...HAW! What a great collection of bunnies you have!!!!!! This is the perfect AW post just before Easter! Maybe I will put them in a post this weekend! Hope the rain has stopped and all will dry up. I have searched for videos about the news of these floodings. Terrible! It looks like so much damage is done. Glad you didn't have so much ruined. Emma is too cute as a bunny! Take care stay warm and dry ! You home is graced with such distinct little works of art...I can tell it is a home filled love...and happiness...:)I love those cabinets~ Ooooh MY they are sweet!